The Holy Disciple and Evangelist Luke, was a native of Syrian Antioch, a Disciple from amongst the Seventy, a companion of the holy Apostle Paul (Phil. 1: 24, 2 Tim. 4: 10-11), and a physician enlightened in the Greek medical arts. Hearing about Christ, Luke arrived in Palestine and here he fervently accepted the preaching of salvation from the Lord Himself. 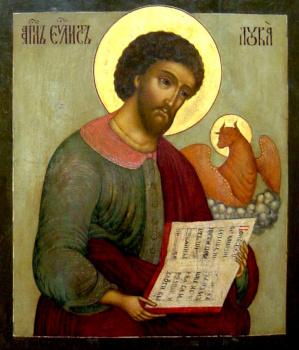 Included amidst the number of the Seventy Disciples, Saint Luke was sent by the Lord with the others for the first preaching about the Kingdom of Heaven while yet during the earthly life of the Saviour (Lk. 10:1-3). After the Resurrection, the Lord Jesus Christ appeared to Saints Luke and Cleopas on the road to Emmaus. The Disciple Luke took part in the second missionary journey of the Apostle Paul, and from that time they were inseparable. At a point when all his co-workers had left the Apostle Paul, the Disciple Luke stayed on with him to tackle all the toiling of pious deeds (2 Tim. 4:10-11). After the martyr’s death of the First-Ranked Apostles Peter and Paul, Saint Luke left Rome to preach in Achaeia, Libya, Egypt and the Thebaid. In the city of Thebes he finished his life in martyrdom. Tradition ascribes to him the writing of the first icons of the Mother of God. “Let the grace of He born of Me and My mercy be with these icons,” said the All-Pure Virgin in beholding the icons. Saint Luke wrote likewise icons of the First-Ranked Apostles Peter and Paul. He wrote his Gospel was written in the years 62-63 at Rome, under the guidance of the Apostle Paul. Saint Luke in the preliminary verses (1:3) spells out exactly the aim of his work: he recorded in greater detail the chronological course of events in the framework of everything known by Christians about Jesus Christ and His teachings, and by doing so he provided a firmer historical basis of Christian hope (1:4). He carefully investigated the facts, and made generous use of the oral tradition of the Church and of what the All-Pure Virgin Mary Herself had told him (2:19, 51). In the theological content of the Gospel of Luke there stands out first of all the teaching about the universal salvation effected by the Lord Jesus Christ, and about the universal significance of the preaching of the Gospel. The holy disciple likewise wrote in the years 62-63 at Rome, the Book of the Acts of the Holy Apostles. The Acts, which is a continuation of the Four Gospels, speaks about the works and effects of the holy Apostles after the Ascension of the Saviour. At the centre of the narrative is the Council of the holy Apostles at Jerusalem (year 51 A.D.), a Church event of great critical significance, with a dogmatic basis for the distancing of Christianity from Judaism and its independent dispersion into the world (Acts 15: 6-29). The theological objective of the Book of Acts is that of the Dispensation-Economy of the Holy Spirit, actualised in the Church founded by the Lord Jesus Christ, from the time of the Ascension and Pentecost to the Second Coming of Christ.